3 sets of eyes are better than 1…right? I just returned from a 4-day desert mule deer hunt with my wife and oldest son (age 9), and it was the perfect mix of awesome and frustrating. 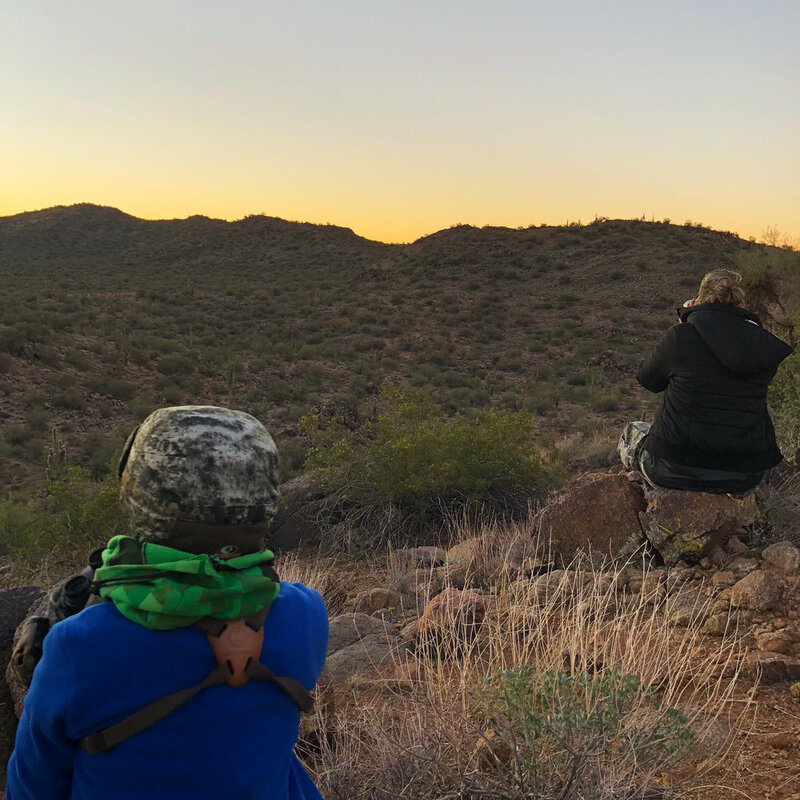 I LOVED sharing my passion for the outdoors with my family and seeing my son have some great first-time experiences, but there were those moments where the hunt was impeded, where whining was the order of the day, and where I was just ready to start a full-fledged dad-rant! So, how do you do it? How can you create awesome memories and raise your kids with a love of the outdoors without going insane? Well, I’m certainly still figuring it out, but here are five things I’ve learned that help everyone have a much better time. There will still be periods of frustration and “teachable moments” (translation: those times when you might just leave your whining son on the side of the mountain), but these ideas can help mitigate the worst of it. This sounds like survival 101, but it is amazing how cranky everyone can become if they are cold. And if your family is anything like mine, you will be amazed at how much colder they can become than you. This last hunt, the lowest of the low temps was about 42*…you would have thought we were staying at the South Pole. Many times, I was still in a T-shirt, and my wife and son were throwing on 2 and 3 outer layers. I could mock them, I could try to “toughen them up” and make them endure the cold for another 10 minutes, or I could just help them get warm and comfortable, throw another log on the fire, and whip up some hot chocolate. I chose the latter. Practically, this means clearing room in the truck for what seems like an exorbitant amount of clothing for a relatively short trip. It means buying hand-warmers in bulk, because they are cheap and effective. [PRO-TIP: Buy the Super hand-warmers and throw one in the bottom of everyone’s sleeping bag about 30 minutes before turning in for the night. They will slide into an already warm bag, and that thing will stay at the bottom keeping their feet warm all night long.] And it means bringing or finding more firewood than you might think necessary. Just keep the fire big and hot until bed time – a few extra logs is a small price to pay for a warm, happy family. Sacrificing camo for warmth…thank God deer are color blind…I think! This is especially important advice if your wife (like mine) is big into limiting sugar, worrying about artificial food-dyes, and constantly trying to sneak leafy greens into every dish imaginable. I love her, and am immensely grateful for her efforts to keep us all healthy…but the wilderness is no place for eating like a rabbit! If your outdoor experience also involves hunting, you are probably going to be putting in some miles, possibly climbing some serious elevation, and certainly burning a lot of calories. You have to remember that the boulder-covered ridge that has you winded by the top was exponentially harder for your child’s smaller and weaker legs. Reward that kid with some kale chips at the top, and he’ll probably stick a knife in your leg. This is why I brought bags of less-than-healthy but calorie-rich snacks on this trip. Each morning, I’d pull out his little day pack and refill his water bladder while he picked through the cooler and grabbed Clif Bars, PayDays, Peanut-Butter Crackers (there were also apples, bananas, raisins, and a few other “healthier” treats…I’m not insane), and he stuffed his pack full. Knowing he had his own hand-picked snacks waiting for him at the top of each hill really seemed to help keep him motivated as the inclines got steeper. Aside from snacks, also consider this with your meal planning. 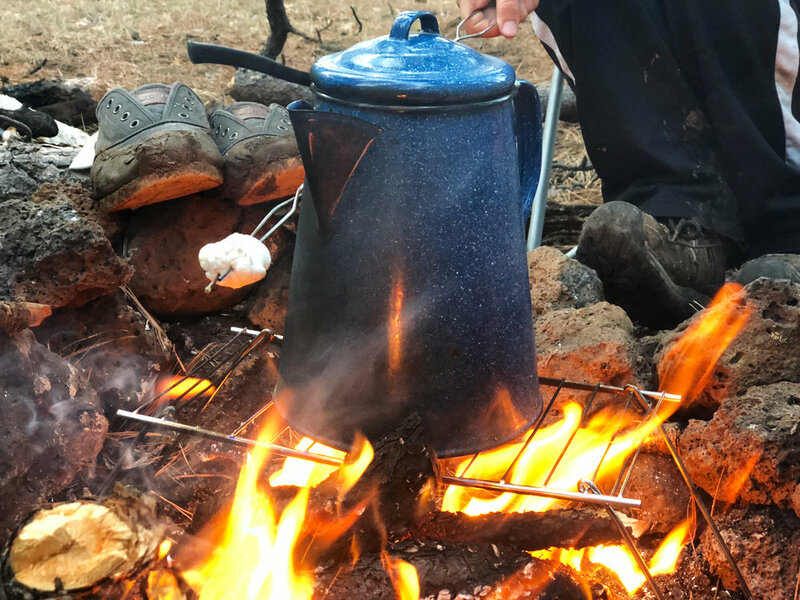 We always go for easy but hearty meals while camping: breakfast-for-dinner, hearty chili, burgers…whatever your family is into and that will be hot and satisfying after a long day of hunting, go with that. Also, don’t forget the s’mores! I NEVER bring s’mores stuff on a solo hunt because what’s the point…but nothing says “I’m a friggin’ master of the wilderness” to a 9-year-old boy like roasting up a s’more at the end of the night. What could be more American than a boy roasting a marshmallow in the wilderness???? 3) Adjust your mental priorities. This is probably the most important tip, and also the most difficult to execute. As soon as you bring young kids along on a hunt, your odds of success go down…it’s just true. That’s not to say it isn’t a worthwhile sacrifice to make, but it’s just something to be mentally prepared for. We went out all together the first two days, and my wife and son stayed back to sleep-in the third morning (we pushed it a little hard on day 2). That third day was the ONLY day I was at my glassing point before sunrise…it’s just harder to get three people of varying fitness levels a mile up a mountain in the dark than one dude barreling through to beat the sun. Also, when you glass up your target, it’s going to take longer to make a play on him, your group is going to make more noise trying to sneak into range than you would alone, and if your child is anything like mine they will forget to whisper from time to time (usually at the absolute worst times). The point of all of this is that if your top priority is harvesting the buck of a lifetime, you are going to be constantly frustrated, you’ll yell at your family, and everyone will have a miserable experience. 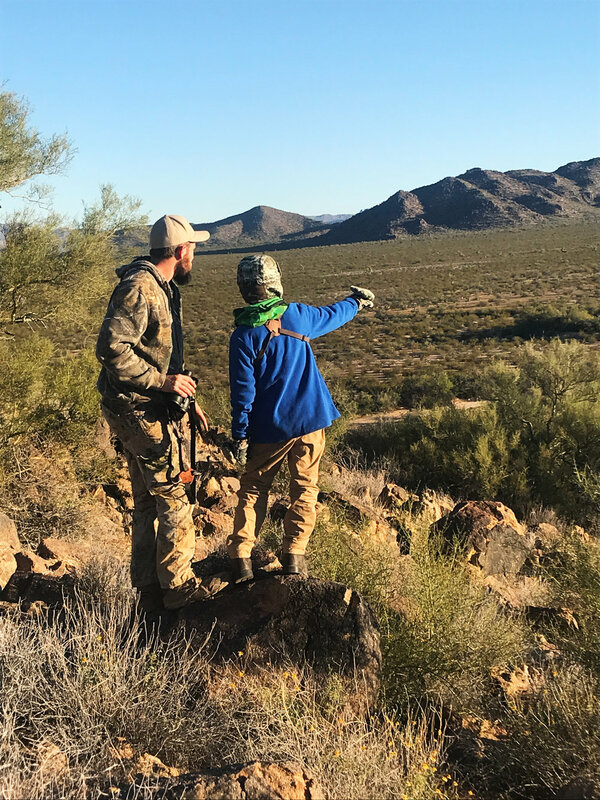 If, however, you flip your mindset and your top priority is giving your family a great experience, teaching your kids some basics about hunting, and making memories that will last a lifetime, you’re going to have a great trip. Harvesting an animal has to become a secondary goal…almost an unexpected bonus. Again, this is easier said than done, because we all want to harvest an animal whenever we head out into the field. This is why I would also recommend not taking your family on EVERY hunt. Choose one that is a lower priority or when your freezer is already full, and bring the fam along for some fun in the outdoors. If all you do is hike around and glass up a few animals in the wild, put that trip in the win column. 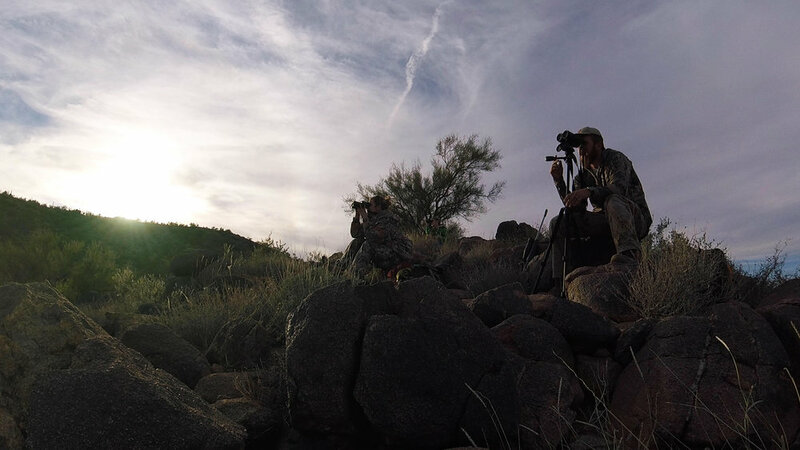 Then, set aside your more serious hunts for yourself or you and your hunting buddies, and make the top priority during that hunt the pursuit of an animal. My personal glassing was interrupted 1,000 times by the rocks and brush he glassed up and was SURE were deer (they weren’t), but he was part of the action and that was my main goal! 4) Make the kid feel like he has purpose. 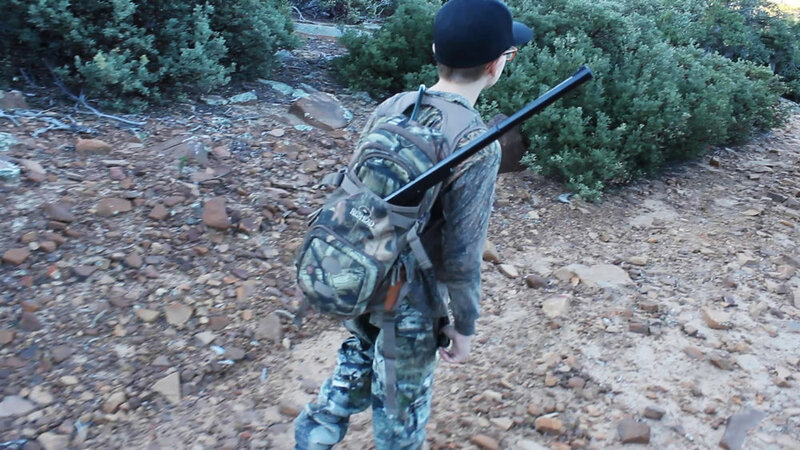 If you are bringing a child who isn’t old enough to hunt yet or doesn’t have a tag for some reason, he/she will be much more prone to boredom and whining if you don’t give him some sense of perceived purpose. If your kid is just following you around the wilderness while you do everything, they’re just going to get annoyed and start annoying you as a result. Strap your kid up with a set of binoculars, plant him at a different angle, and let him know you’re counting on him to glass this particular hillside since you’ll be focused on another area (don’t worry, you can always “double-check” his hillside from time to time). When I took my son out for the first time on a bear hunt, he was insistent that he should bring his bb gun, just in case. Now, I made sure he understood that, should we actually be charged by a bear, he knew his job was to get behind me and let me deal with the threat. But at the end of the day, if he was going to feel like more of a man or a hunter by stuffing his Red Ryder in his day-pack, then go for it, kid…what’s the harm? Let your kid help with starting the fire (in fact, you should teach him how to build one from the ground-up anyway), tell him you NEED his help setting up the tent (and don’t mention that you’ve set it up by yourself 1,000 times before), and let him take some age-appropriate risks. Get him a pocket knife and let him whittle some stuff, let him work at splitting wood, let him explore the next hillside over on his own and come back and report if he saw any game over there. Time in the outdoors is jam-packed with opportunities for a young kid to stretch his legs and exercise some independence…capitalize on those opportunities! Nothing says, “master of your domain” like a Red Ryder in your day-pack! 5) Don’t expect a seasoned hunter’s attention span. If you’re an outdoorsman with at least a couple hunts under your belt, then you know full-well that hunting consists of long periods of boredom. The brief moments of sheer exhilaration that keep you coming back season after season are broken up by hours upon hours of sitting and waiting. Now, you’re a grown-up who can handle that sort of thing for the potential pay-off at the end…your child is not wired the same way. Their still-developing brains are simply not capable of letting them sit totally still staring at an empty hillside for hours at a time. You could bemoan that and fight with your kid throughout the whole hunt, or you could simply accept that reality and come prepared. My son is a voracious reader, so he had a book in his pack at all times. I’ve taken him on hunts where I let him bring a tablet and play games for minimal periods of time, he has a knife and I would challenge him to whittle specific creations (“whittle me a giraffe”…that kept him busy for a while). Now, these are specifically designed for those down-times between prime hunting hours. Early in the morning and late in the afternoon, we were all glassing and he was part of our “glassing team.” But, at 1pm when we’re all hunkered in the shade knowing that nothing is really going to happen for another few hours, these little tricks kept him from losing his mind and allowed my wife and I to catch a quick nap on the hillside. In short, don’t expect a veteran hunter’s attention span from your young kid. Come prepared with a few activities to keep him/her occupied, and you’ll both have a much better experience. Obviously, that is less than ideal! But giving him 20 minutes every now and then helped us BOTH have a better time during the hunt. So, there you have it – 5 key tips from my family to yours to help you have a great experience in the outdoors. But, since every family is a little different, what has worked for you in the past? What tips or tricks could we all benefit from that have saved your sanity while enjoying the outdoors with your family? Please share below!